Latham, NY (August 23, 2017) –Deep Blue Communications, LLC, an international Wi-Fi installation and support company, headquartered in Latham, NY, and the Historic Saratoga Race Track in Saratoga Springs, NY have teamed up to deliver expanded Wi-Fi services for an improved guest experience, making the historic track an industry leader in Wi-Fi connectivity. The 154 year-old venue is the oldest, continually run sports venue in the U.S. As part of the 2017 Saratoga Racing Season, the Saratoga Race Course, managed by the New York Racing Association (NYRA), unveiled an upgraded infrastructure to allow NYRA to enhance the overall guest experience by more than doubling the facility’s Wi-Fi capacity. NYRA partnered with Deep Blue Communications to provide Wi-Fi network engineering and installation expertise for a very difficult installation. 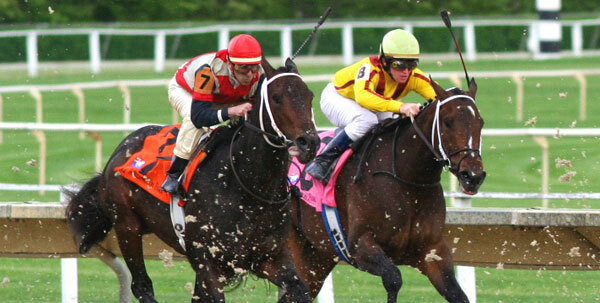 The Saratoga Race Course may be one of the most “connected” sports venues where more than 80% of the fans who visit the track use their mobile devices daily. Each day terabytes of data is carried over the Wi-Fi network which also supports most internal operations as well. As part NYRA’s commitment to continuous improvement and innovation, NYRA also unveiled its new NYRA XP app, allowing guests to take advantage of a host of new services. NYRA’s commitment to technology innovation in all aspects of it’s operation provides a guest experience that is amongst the very best in the sports industry. Visitors to the track can purchase and scan tickets, find their seat, pin their parking location, and find the shortest route to everything from bathrooms and concessions to ATMs and betting windows. And if guests don’t want to leave their seats, NYRA XP seamlessly integrates with the NYRA Bets and NYRA Now apps, allowing guests to easily place bets or view cameras from around the track, watch replays or view live NYRA broadcasts from wherever they are. Fans are also able to “xpress order” food from select concessions around the track. “From our unparalleled video app, NYRA Now, our industry leading television broadcasts, the best wagering app in the country and now the “all inclusive” NYRA XP mobile app …NYRA continues to push the digital envelope with technology innovation and partnering with firms like Deep Blue Communications make this all possible. They constantly exceed my expectations”. Bob Hughes – Chief Information Officer for The New York Racing Association. NYRA XP is available for free download in iOS (Apple) and Android (Google Play) stores.